They are fatty and full of calories, but you should still grab a handful of nuts when they are handed round at Christmas parties. Research in this week's New England Journal adds to evidence that's been amassing for 20 years showing the health benefits of nuts. This latest paper followed 118, 962 people for nearly 30 years; 27,429 of those case studies died. But those who regularly ate nuts were likely to live longer (even after allowing for other risk factors). Snacking on nuts seven times a week reduced the risk of dying from all causes by 20% during the study. For those who ate them only once a week, the reduction was 7%. Specifically, eating nuts five times a week led to a 29% drop in dying from heart disease and an 11% drop in cancer deaths. The study found that people who ate nuts were more likely to lead healthier lives and less likely to smoke or be overweight. So should we indulge our nut cravings or will that just add inches to the waist? And is it all nuts, or just the posh ones such as walnuts? And what about chocolate nuts? Nuts are quite remarkable foods, as they have lots of calories for their size and are rich in unsaturated fatty acids (many studies have shown they are associated with lowering cholesterol) but research suggests that people who eat them in moderation weigh less than those who don't touch them. They are associated with reductions in diabetes in women and fewer gallstones in both men and women. And they may protect women from both colorectal and endometrial (the lining of the womb) cancers. It is worth noting that this latest paper was partly funded by the International Tree Nut Council Nutrition Research and Education Foundation, although it took no part in the study. Tree nuts - and the studies include almonds, hazelnuts, pine nuts, cashews, pecans, brazil nuts and macadamias - are cholesterol-free. Peanuts, which are actually legumes, have a similar nutritional profile. Nuts are remarkable foods, containing lots of unsaturated fat (46% in cashews), protein (25%), fibre and essential micronutrients such as folic acid, niacin, calcium, magnesium and potassium. 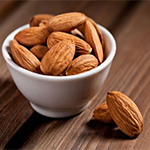 The fatty bit of nuts contains phytosterols, which help to lower cholesterol. And, providing they are they are unsalted, they contain relatively little sodium. The latest study, however, can only show an association between eating nuts and living longer. Its design, in which people were regularly surveyed about their nut-eating, does take into account lifestyle (whether they took exercise, drank alcohol, took vitamin supplements) that influence the risk of dying. But it can't prove cause and effect because other factors might also have influenced the results. Still, as long as they are not covered in salt, chocolate or honey, research shows a small portion of nuts five times a week is good for us. © 2013 Guardian Newspapers Limited.